mary from alpineberry chose this month’s daring bakers challenge – bostini cream pie. this is not a dish i’ve ever come across. nor do i know boston cream pie from which this recipe is derived. in summary it involves making a vanilla custard which hopefully sets so that you can turn it out of its mould. this is then topped with chiffon cake (not heard of chiffon cake before? 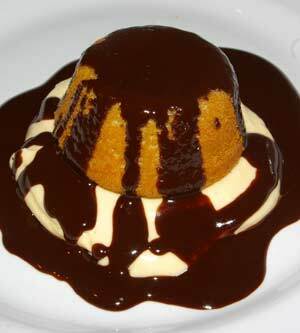 me neither – apparently it’s a light moist cake which uses oil as its source of fat) and a chocolate glaze. the original recipe calls for 10 eggs, 80ml vegetable oil, 200g of each butter and chocolate plus almost a litre of double cream. this is definitely not a recipe for those among us who’re concerned with watching our weight! still, the rules of being a daring baker means getting on with it and following the recipe. i decided to scale everything back and made four individual bostinis. custard – this was dream to make and even better to eat. i was nervous as a couple of daring bakers had problems so i did some research – a high proportion of yolks helps thicken the custard so i chose eggs which i know have large yolks (and the possibility of a double-yolker! ), constant mixing while “cooking” the custard is also key, ensuring that every bit of mixture is constantly being stirred in. this custard was beautiful and i’d happily use this recipe again. chiffon cake – the key here is, apparently, to make sure that your egg whites are beaten until stiff, otherwise there is a risk of the mixture seperating as it cooks. i decided to make individual cupcakes and this worked well. the orange taste is nice but the cake itself isn’t that exciting. 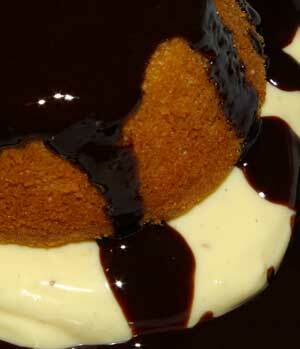 chocolate glaze – make sure you use unsalted butter for this. by mistake i made an initial batch with salted butter and it was completely inedible. this is a good glaze which thickens as it cools so would be good for icing cakes with as well as serving hot as a sauce. would i have tried this recipe if it hadn't been part of the daring bakers challenge? no, the high fat and egg content would put me off. would i try this recipe again in the future? no. i didn’t like the finished pudding – it was far too rich for me and the flavours of the different components got lost when it all came together. i did like the custard though and would happily make this again, to serve warm with a crumble or as the base for a crème caramel. for the full, and original recipe visit alpineberry. to prepare the custard: combine the milk and cornflour in a bowl; blend until smooth. whisk in the whole egg and yolks, beating until smooth. combine the cream, vanilla and sugar in a saucepan and carefully bring to a boil. when the mixture just boils, whisk a ladleful into the egg mixture to temper it, then whisk this back into the cream mixture. cook, stirring constantly, until the mixture is thick enough to coat the back of a spoon. strain the custard and split between 4 containers*. refrigerate to chill. to prepare the chiffon cakes: preheat the oven to 170c. lightly oil 6 muffin moulds. sift the flour, sugar, baking powder and salt into a large bowl. add the oil, egg yolks, orange juice, zest and vanilla. stir until smooth, but do not overbeat. beat the egg whites until soft peaks form. gently fold the beaten whites into the orange batter. fill the moulds nearly to the top with the batter. bake for 20 minutes, until the cakes bounce back when lightly pressed with your fingertip. do not overbake. remove from the oven and let cool on a wire rack. when completely cool, remove the cakes from the moulds. cover the cakes to keep them moist. to prepare the glaze: chop the chocolate into small pieces. place the butter in a saucepan and heat until it is just about to bubble. remove from the heat; add the chocolate and stir to melt. pour through a strainer and keep warm. to assemble: cut a thin slice from the top of each cake to create a flat surface. place a cake flat-side down on top of each custard. cover the tops with warm chocolate glaze. serve immediately. * my custard was not solid enough to remove from its mould. other daring bakers had success using foil moulds which can be peeled away. if you can’t get these, i’d just refrigerate the custard in a single bowl and then spoon it onto your serving plates when ready.